“Cog in a machine”—That used to be not only the reality, but also the ideal, of an employee at work. 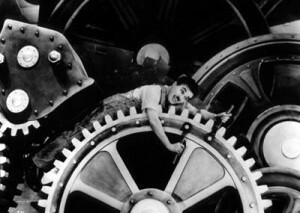 The clockwork employee personified by Charlie Chaplin, slithering through the gear work of a juggernaut machine in his 1936 movie takedown of Depression-era factories, jobs and joblessness, “Modern Times”, was a toiling icon of the industrial Mechanical Age. A well-oiled, smoothly running 19th- and 20th-century office or factory required workers who, like interchangeable or replaceable parts on an assembly line or gears in a clock got the job done without any quirky intrusion of personality or personal life. Not only did and does the worker as automaton and cog punch and follow the clock, he worked (and, even now in many jobs) like a clock—mechanically, reliably, uniformly, smoothly, and impersonally. Like God, the mechanical Clock (re)created man in, as well as within, its own image. However, since then and for many modern non-industrial jobs, the real and the ideal employee has evolved into something quite different: Instead of cog in the machine, the new recruit is likely to see himself and be seen by his employer as a node on a web—a web that encompasses not only his workspace, workmates and the online social media and resources he uses, but also significant chunks of his private life, time and energy, with neither a compartmentalization and sealing off of his work time from his private time nor of his persona from his job. Curiously, work seems to imitate science as much as art imitates life and life imitates art: In the previous two centuries a mechanical-clockwork work paradigm and industrial mechanization gained ascendancy at the same time that the mechanical worldview of Newtonian physics prevailed. Mechanization and mechanical science and philosophy were joined at the hip, at the interface of the technology and techniques of the industrial revolution and mechanistic physics. With the 20th-century development of “field theory”, e.g., electro-magnetism, quantum field theory and the concept of ecological webs, the decision to call the Internet a net and the Web a “web” should be seen, in retrospect, as predictable, if not inevitable. 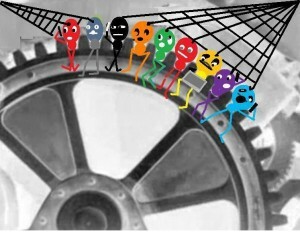 From there, the application of field and web to employee perceptions —their self-perception as well as corporate perception—was as natural and small a step as the extension and application of clockwork thinking to personnel management seemed to be in the Newtonian, industrial and Chaplin silent-movie eras. When mechanical meshing of all the human resources, as parts, dominated the mechanical work model, like mechanical clockwork, the machine’s operations were internal to the machine and man-as-machine integration and interface. Just as, from the performance standpoint, every machine had all of and nothing but its parts within itself or in very close proximity, the average job and worker were sharply demarcated from the rest of that worker’s life. Anything external to the job, such as family, friends, home, clubs and other associations served at best to wind up and synchronize with the clockwork factory and office, without entering it. Punching out on the clock was a welcome time-based demarcation of life time from work time as clearly as the factory gate was a space-based delimitation of a worker’s life space and work space. In its time and intent, and as a cultural icon, Chaplin’s “Modern Times” visually and perfectly summed up this mechanized-and-dichotomized employee model. Symbolically, the opening credits of “Modern Times” feature a huge ticking clock. Chaplin then appears at work—briskly working on an assembly line, struggling to keep up with the line’s frenetic pace, until something personal intrudes—an itch he scratches, a fly he shoos, finger nails he files, which then disrupts production—vividly illustrating the then-perceived fundamental conflict between private and work moments within the clockwork paradigm. Other seepage of “personalization” into work also creates within the film comic and manufacturing incongruity, e.g., when Chaplin momentarily uses the backside of a curvy secretary who has bent over as a shelf for tools, visually blurring the line between human and tool in subtle mockery of the dehumanizing and incomplete mechanical-employee paradigm. His use of an oil can as a toy pistol, with which he creates mayhem, underscores the Clockwork axiom that personal use of work tools—something that current Millennial recruits expect as at least a privilege, if they can’t get it as a right, e.g., the right to use company-issued cell phones for personal calls—is disallowed because it is disruptive. Evidently, even the tools were not allowed to take a break from being tools. Make that “even the other tools”. In one scene, to ensure that such personal, human eruptions are rare, if not eliminated, the company tests an automated employee-feeding machine (also an automated-employee feeding machine) that shovels food into and wipes it from the mouth of a harnessed Chaplin. Displaying the allegorical equivalent of disruptive, unpredictable human personality, the machine short-circuits, goes haywire as it symbolically suggests that all uncontrolled idiosyncrasy is bad for the bottom line. The contrast between the “Mechanical Model” (a.k.a. “Clockwork Model”) of employment and the modern “Web Model” (a.k.a. “Digital Model”) could be more striking only if Chaplin were alive to burlesque the latter as wickedly as he did the former. To fill in the gap provided by his absence, here are some points of difference and pivots for Chalplinesque parody. The Web-ensnared employee still suffers, but not as a weary cog in the machine or a fragmented, compartmentalized personality. Instead, in the web framework, the virtue of holistic, integrated, complete and complementary work-life balance has as its negative flip-side one of the web model’s principle vices: Unlike the Clockwork system, it affords the modern weary employee no refuge from work and imposes the prospect of after-hours jiggling of some node of his work web requiring professional attention. Whereas the Clockwork Model allowed coworkers very limited roles as friends during working hours, thereby denying the employee the “organic” experience of blending “Gesellschaft” (commerce and work) with “Gemeinschaft” (community and friendship) through ongoing production-time friendly interaction with coworkers, the modern Web Model, capitalizing on “social” media turns this inside out by blurring the boundaries between social and professional contacts, and does so well outside the traditional confines of work. In addition to each having negative HR features, it’s almost as though the Clockwork and Web models are photographic negatives of each other: The mechanical clockwork system sharply distinguishes work relations from personal relations and limits both the time and the space of personal and friendly interaction; on the other hand, the web system eliminates the demarcation of relations and removes both the time and space limits, allowing work to follow and chase the employee everywhere, always. The mechanical industrial Clockwork credo, “Work and private life are sharply demarcated; work time and space are limited” becomes the Web mantra, “Work and private life are not sharply demarcated; work time and space are not limited.” Limited to these two choices, the worker is indeed between a rock (-breaking) and a hard (-labor) place. In the Clockwork Model, personal relations grow from workplace relationships, as a counterpoised life-offset to work. While this process is, of course, common in the modern workplace, where workplace friendships are plentiful, the Web Model adds another feature: Personal relationships and acquaintances outside the workplace and after work hours are often mined for contacts, leads, deals and work leverage—which means they are recruited as a work-offset or complement to life. In this respect, the Web Model increases employer capital by transforming employee networks into its potential corporate social capital. Given the forced and unpleasant choice between having to leave one’s persona and personality at home (in the Chaplin-parodied Clockwork work system) or being unable to leave one’s work at work (in the current Web work-life system), Clockwork automaton workers and Web-ensnared office workers alike may be forgiven for any reservations they may have about the application of scientific paradigms to the workplace, workers and work. Somehow and so far, scientific paradigms appear to have some key feature that works for employers a whole lot better than for the worker. Whereas the Clockwork Model used “mesh” as a verb to describe the mechanical functioning of its employee “gears” and cogs, the Web Model makes it a noun that visually approximates the web, a.k.a. mesh, of (often suffocatingly) entangled employee work-life relations. Either way, from the standpoint of both the Chaplineseque automaton Clockwork assembly-line worker and the more modern Web-ensnared office employee, the historical record and pattern suggest that whatever scientific paradigm employers adopt to eventually replace both the clock and the web, the chances are, that with respect to work, that new paradigm will “make a mesh of it”. Even though a new scientific workplace paradigm and the associated paradigm shift always seem to lead to something employers perceive as absolutely better, the same cannot always be said of the paradigm-designed employee experience of being on a paradigm-designed work shift. From this employee perspective and Chaplin’s—were he alive to comment, perhaps our modern times are not so much more modern than his “Modern Times” was, after all.